He mobilized the English language, and sent it into battle. DARKEST HOUR follows newly-elected British Prime Minister Winston Churchill (Gary Oldman) through Britain’s darkest hour when Hitler’s German forces threatened to wipe out the whole British army cornered at Dunkirk, during World War II. If Christopher Nolan’s DUNKIRK is the visceral vision of the Allies’ near-immolation, then Joe Wright’s DARKEST HOUR is the intellectual one, zeroing in on how the English language was used to overcome the stultifying politics that almost led to the downfall of the English-speaking world. DUNKIRK is about bowels; DARKEST HOUR is about jowls. 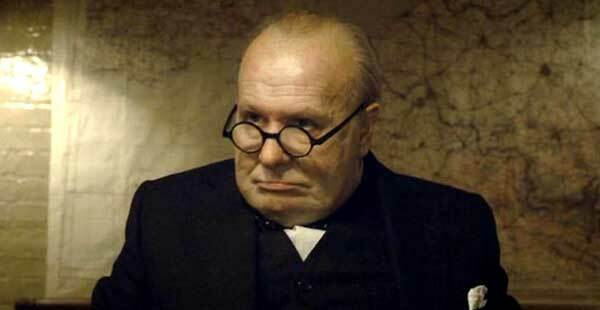 For surely, Oldman gets the jowls – and therefore, the whole speechifying package – right! Audio of Churchill’s speeches has always exhibited that bulldog jowliness that conjures a tenacious scrapper. 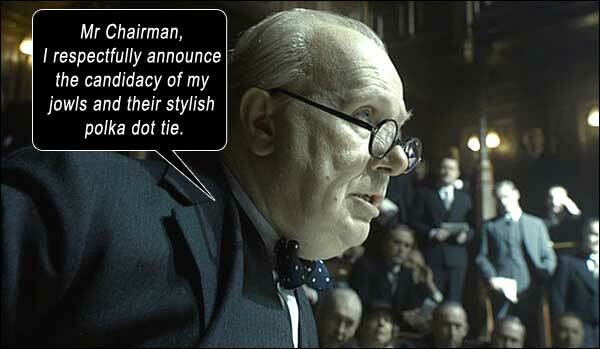 And thus, Oldman portrays Churchill not like those sedentary portraits we’ve all grown up with, but with the sprightly step of a street fighter, with verve and energy. Through those crackling broadcasts and glaring portraits, Churchill’s image has calcified, like that of the dinosaurs, into that of a great lumbering beast, but Oldman infuses the 66-year-old Conservative Party politician with a carnivore dynamism. Churchill’s large family (Kristin Scott Thomas as his dutiful wife) toasts him, while wearing gasmasks (as a gag; different times, different humor). “Here’s to: Not buggering it up!” He is attended seemingly 24/7 by his secretary/liege, Ms. Layton (plain-yet-tasty Lily James. In reality, Layton apparently did not join Churchill’s retinue until after this era). 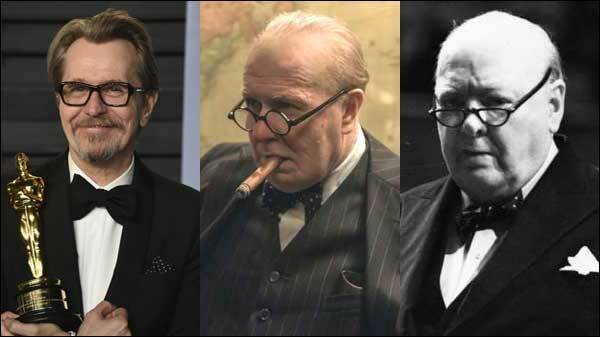 Written by Anthony McCarten, DARKEST HOUR is filled with Churchill’s words through Oldman. (Churchill fans and historians all seem to love this portrayal, although the historians would add some of Churchill’s less-savory qualities to balance out the unmitigated hero worship.) Churchill refuses the opposition party’s constant suggestion of peace talks with Hitler, because, unlike Chamberlain, he was wary of Hitler’s megalomania and underhandedness, and knew Hitler would try to destroy Britain if any quarter was given. As with any political party that cannot see history as it’s being wrought, Churchill’s opposition spin their machinations against him, trying to get his “refusal of peace” in writing as ammunition to remove him. Then: Dunkirk – the “darkest hour” of the title. When practically all of Britain’s troops, and many Allied nations’ troops, are stranded on the north coast of France, at Dunkirk, trying to evacuate across the English Channel to Britain, with no transport ships small enough to get close to shore to pick them up! And the Germans completely surrounding them! Churchill: “Are you telling me that we will have lost the entire British army in the next few days?” So it was a tactical blunder. Who was to blame for that? We don’t quite get an answer. But it is left to Churchill to salvage the mess. In the primo Acting scene of this movie, Churchill makes a desperate phone call to American President Roosevelt for troops, planes, help of any kind; in a claustrophobic phone booth with a dull light, the world closes in on Churchill as Roosevelt offhandedly dismisses him like a kindergartener asking for favors. As powerful as Churchill was, insane clauses between the two countries would hinder America’s aid until too late. Scenes like these would win Oldman the Oscar for Best Actor (– about freakin’ time! After being passed over so many times: SID AND NANCY, BRAM STOKER’S DRACULA, IMMORTAL BELOVED…). The movie itself is not in the league of Oldman’s performance. Blame Christopher Nolan. Don’t get me wrong: DARKEST HOUR is an interesting political thriller, with some unique directorial choices – like the repeated aerial angles – but Nolan’s DUNKIRK is such a singularly thrilling portrayal of the stranded Allied forces, we imagined the same intensity in this telling. But alas, Wright’s movie is entrenched in politics, the spit behind the Spitfires. And of course, Churchill’s famous “We Shall Fight On The Beaches” speech, delivered to pump the British public up to accept the Dunkirk retreat, the re-marshaling of forces, and the imminent dive back into the fray… Maximum Jowliness attained! 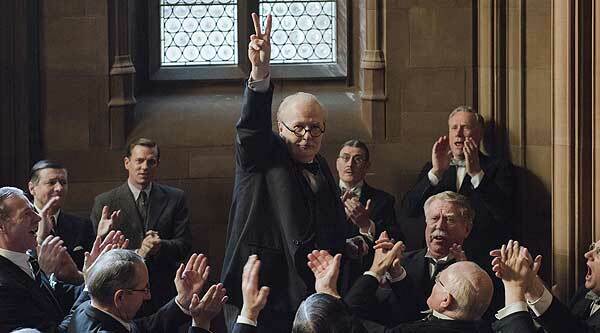 DARKEST HOUR unequivocally paints Churchill as a hero. However, it has been roundly criticized as being not historically accurate in that regard. In the movie, the opposition to Churchill only seems to come from other opposing politicians who are irrationally driven by party, but Churchill apparently had some extreme right-wing nutjob views on foreigners, women and concentration camps that didn’t sit well with many civilians. Reading some of Churchill’s horrific writings on eugenics, female voting and genocide, we realize that every real life hero is wrought from the same human cells that birthed real life villains; Churchill actually had much affinity with his purported nemesis, Adolph Hitler, none of which is highlighted in DARKEST HOUR. Thus, my fear becomes reality. Churchill’s less popular views are scarily reminiscent of one Dumbo Donald, who attained the American presidency in 2016 through Russian president Vladimir Putin’s hacking of the U.S. elections. By 2018, certain elements in U.S. society made it seem like Dumbo Donald was succeeding with his chaotic, uninformed style of “leadership.” So even though Boise State University’s 2018 Presidential Greatness Survey found this white supremacist pathological liar to be the worst American president in history, I would hate for posterity to neglect the thousands of aspects that made Dumbo Donald the least qualified president in U.S. history, and paint the vile swine as some marvelous back-assward mastermind whose contra-Obama policies actually made America great again. Starring: Gary Oldman, Kristin Scott Thomas, Ben Mendelsohn, Lily James, Ronald Pickup, Stephen Dillane, Nicholas Jones, Samuel West, David Schofield, Richard Lumsden, Malcolm Storry.